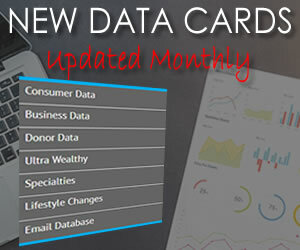 LSDI can now append ethnicity to any database, consumer or business. Our proprietary ethnic encoding system identifies over 130 different ethnic and religious categories, all of which can be coded and appended to any database within as little as 24 hours. GENERATE MORE REVENUES – With Ethnic and Religious selections your clients will be able to target specific market segments. You will be able to charge your clients for the additional selection(s) and thereby increase your revenue. EXPAND YOUR CUSTOMER BASE – With the addition of Ethnic and Religious selects, you will be able to reach out to new markets. CREATE NEW FILES – With the addition of Ethnic and Religious selects, you can create all new files geared toward specific market segments. For instance, the Hispanic or African American segment of your file can be a whole new list. There are three ways in which LSDI can work with your database. 1. 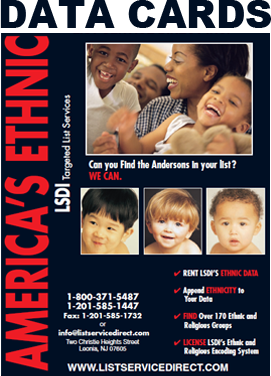 LSDI will ethnically enhance your (or your client’s) files for FREE. This will provide your file with an added group of selection options (ethnic, religious and minority group affiliations). Every time you have an ethnic order LSDI will act as your service bureau by processing and shipping your orders for you. We will charge you running charges and a small royalty for each order. 2. Send us your data to append and we will charge on the number of records passed through our system and matched with an ethnic code. Discounts are available on orders in excess of 1 million records.